The electric power industry is in the midst of a wide-scale, profound, foundational change not seen since electricity was first commercialized a century ago. Generation is migrating from large, central, power stations to smaller-scale distributed systems, and from firm fuel-fired generation to unprecedented amounts of cleaner variable renewable generation. This industry shift involves a number of factors: state-level regulations and statutes, emission reductions, technological innovation and advancement, generation economics, maturing renewable energy resources, and consumer involvement and preference. Because of this industry shift, integrated resource planning is undergoing a wholesale transformation. The prime drivers behind this transformation are the growing influx of renewable generation, especially from distributed energy resources (DERs); transmission and distribution challenges; demand-side resources; energy efficiency measures; mandated policy targets; and the increasing complexity, uncertainty, and risk on the electric power grid. For the past 30 years, integrated resource planning has been based on central station firm dispatchable generation with long service lives; sited at specific locations; fueled mainly by gas, coal, oil, and nuclear; with well-established reliability and high availability on one-way transmission and distribution systems. Today, integrated resource planning is mainly marked by an influx of new and emerging technologies, a smarter grid, load reducing drivers, and small variable distributed renewable generation on a two-way grid distribution system. As a result, integrated resource planning no longer starts at one end, flowing in one direction across the grid to end-use consumers, but rather at the grid edge near these end-use customers (who both consume and generate energy) where technology advances decentralized and distributed resources. The current transformation in integrated resource planning has created a plethora of consequential challenges that test that planning process and demand a fundamental reworking of how integrated resource plans (IRPs) are conceptualized, modeled, analyzed, developed, and implemented. Utilities alone no longer determine the grid’s destiny. For over one hundred years, the electric power grid grew to support a one-way flow of energy from generation to end use. Over the past several years, however, that fundamental model has slowly evolved. Today, power on the grid flows in two directions caused almost exclusively by the influx of small-scale distributed energy resources. Energy from large, central generation facilities sited away from population centers because of their size, unsightliness, and environmental impact, flowed through a structured transmission and distribution system to consumers. This traditional grid structure is defined by a few, large-scale generation points providing the necessary ancillary services, with centralized, manual controls flowing in one direction with predictable loads and generation. System resource planning involved identifying sufficient generation resources to meet projected customer needs, building and siting that generation, then upgrading the transmission and distribution systems to transmit energy to customers. Figure 1 illustrates this one-way power flow. Over the past several years, rapid technological changes have upended this traditional structure. More and more, this structure is being transformed by customer-sited and small producer generation resources at the grid edge pushing energy onto the distribution grid, creating two-way energy flows on a system originally designed for one-way flow. This transformation is also being fueled by the arrival of electric vehicles as a realistic, desired transportation option. At the same time, the grid must support increasing demand response technologies that enable utilities, customers, and third parties to benefit by automatically adjusting their loads based on need and preference. This modern power grid is marked by an incredibly large number of small-sized generation and control points, requiring flexibility in providing and optimizing ancillary services, with distributed automated controls managing a two-way power flow with increased variability in loads and generation. End users are both consuming and producing energy. Not surprisingly, this transformation requires changes to the integrated resource planning process utilities have traditionally implemented to operate a reliable power grid. For the grid to remain the energy backbone for years to come, it must be maintained to deliver innovations and provide reliable service. Figure 2 illustrates this evolving grid structure. This transformation away from a one-way electric grid, to a bidirectional grid increasingly comprised of variable and distributed renewable generation is causing a concurrent upheaval in integrated resource planning. “A successful utility’s resource plan should include consideration in detail of the following elements: a load forecast, reserves and reliability, demand-side management, supply options, fuel prices, environmental costs and constraints, evaluation of existing resources, integrated analysis, time frame, uncertainty, valuing and selecting plans, action plan, and documentation.” Add to this list consideration of emission reductions, regulatory and statutory target compliance, distributed energy resource management, transmission and distribution modernization, and costs and bill rate implications. Actionable IRPs are based on the validity and accuracy of these elements—all of which have increased in volatility over the past several years and promise to continue to evolve. More and more, the ultimate purpose of integrated resource planning is to first satisfy regulatory and statutory mandates; and to second, actually create an IRP. Integrating increasing amounts of variable renewable generation, especially from distributed energy resources (DERs), is at the foundation of both issues. In varying degrees, both issues derive from legislative mandates, regulatory policy, stakeholder and intervenor involvement, and public pressure. Both issues have made integrated resource planning far more complex and difficult. The focus of an IRP has shifted from a balance of generation, reliability, and cost to an overriding focus on integrating renewable generation at the expense of cost, while leaving reliability up to the utilities. Least-cost planning has shifted to a combination of cost and risk planning; a preferred portfolio plan has shifted to satisfying regulatory and statutory mandates first, then developing a generation mix to meet demand. The number of input assumptions is growing, their data becoming more sensitive to fluctuation and with shorter accuracy horizons. In addition, planning parameters are becoming more complicated to exact, and basic planning considerations are becoming malleable. Without more accurate planning tools, modeling software, grid data, and wider-ranging processes, this shifting focus and increasing difficulty and complexity portends the integrated resource planning process almost to the point of obsolescence. IRPs are necessary and valuable tools for a utility to look from five to 20 years into the future. Traditional IRPs match resources to projected, predictable demand with complementary investments in a limited choice of large-scale generation together with straightforward transmission and distribution investments. In this world, resource management was an exercise in replacing dispatchable generation at the end of its life cycle with newer, modern firm generation at the least cost. When resources consisted of central station generation, planners had a fair amount of insight and control over the future because very little else was going on in the system. This clarity helped planners develop meaningful IRPs that played out linearly, both in the near term and long term. Changing customer demand and growing penetration of variable and distributed renewable generation resources, especially from wind and solar, has introduced uncertainty on both the supply side and the demand side of utility operations. This fundamental shift has led to a transformation in the integrated resource planning process. While the integrated resource planning process still remains valid, its implementation is evolving and becoming more complex as planning elements have become increasingly difficult to capture, develop, model, analyze, and project. In addition, DER proliferation, environmental considerations, net load reductions, energy efficiency measures, technological advances, and many other elements are beyond a utility’s direct control. These elements form the foundation of the analysis and decision-making that comprises an actionable IRP, yet all these elements are becoming increasingly volatile and complex, and thus difficult to capture in a meaningful way, making it more difficult to develop meaningful IRPs. Today, utilities operate in an increasingly DER world. The most profound change in this world is that planning must now occur at the decentralized grid edge, starting with must-take DERs sited where customers choose, and filling in from there. DER data is, at best, difficult to assess and capture, and then integrate into an IRP action plan. The planning process has also become more complex in other ways. It’s becoming more difficult to quantify the impact of variable renewable generation on the system, as well as to project accurate regional pricing in the various energy markets. Inputs and assumptions into the resource planning process are becoming more difficult to quantify and accurately sustain over the planning period. Increasing penetrations of DERs requires resource planning to extend across the entire transmission and distribution interface. Utilities are finding that more departments within the organization need to be involved in resource planning: transmission and distribution as well as innovation and information technology. In addition, efforts among these groups must be coordinated. As a result, the entire resource planning process must be rethought and restructured. This restructuring, however, takes time to develop and coordinate. Meanwhile, DERs continue to proliferate, and regulatory and statutory goals begin to creep up as the time frame in which to create a meaningful IRP shrinks. Resource planning must meet four core requirements: policy measures, generation options, cost considerations, and reliability requirements. In traditional resource planning, these four requirements were considered in equal balance. More and more though, the equal balance of these four requirements has shifted to becoming more hierarchical. Increasingly, resource planning has become about meeting policy decisions first, with forced and chosen generation options second. This leaves less emphasis on cost, and even less on reliability. The increased focus on integrating renewables has had the unintended effect of demoting the focus on reliability in the planning process. Yet, for utilities, reliability is a critical planning factor. No one will accept less reliability. This hierarchical trend can create problems for utilities who keep paramount reliability and cost while planning to meet policy and renewable generation goals. Reasonable Cost Plus Lowest Risk Planning.For many utilities, the underlying resource planning process has transitioned from strict least-cost planning to cost-and-risk planning, mainly because integrating variable renewables requires careful focus on meeting reliability and other system needs. IRPs, then, are not for designing the lowest-cost preferred portfolio, but for a reasonable cost portfolio. A number of factors influence this change, mostly centered around the increase in DERs and other variable renewables. This is especially problematic when renewable generation is not the lowest cost alternative or when integrating increasing amounts of renewable resources forces the early retirement of existing firm generation. There are, however, other factors to consider. Renewable energy pricing has experienced tremendous drops, and projections show renewable energy and related costs to be lower in the future. Thus, spending money now could be considered an investment that prepares for increasing price drops and technological advances. In addition, prices for renewable generation do not consider the related lower societal costs that come from cleaner air, reduced fossil fuel extractions, the positive economic impacts of renewable energy, and increased consumer awareness that tends to result in less energy usage. These societal costs, however, are relatively invisible as they are not out-of-pocket savings, and are traditionally not inputs into planning models. Utility Ownership of Renewable Generation.The transformation in resource planning has given rise to another consideration: Is the lowest long-term cost for renewable generation derived from utility ownership or from power purchase agreements (PPAs)? Some utilities are reconsidering ownership as a way of reducing long-term costs because the continuing value of ownership would be less expensive than the alternatives. In addition, the utility would own the resulting renewable energy certificates (RECs). On the other hand, the argument in favor of PPAs is mainly about this: with today’s rapid advancements in technology and the evolving maturing of renewable generation, PPAs offer more flexibility and agility to change resources and portfolio mixes than owned generation. Distributed energy resources, together with the proliferation of both small-scale and large-scale variable renewable generation—with their fair-weather reliability and relatively low capacity factors, fueled by sources that cannot be controlled—has primarily set in motion the profound transformation in integrated resource planning. Most DER installations are solar photovoltaic (PV), from either rooftop solar or small-scale installations. Four states—California, Hawai‘i, Nevada, and Vermont—already obtain more than 10 percent of their generation from distributed solar. Since 2015, total solar power in the United States has essentially doubled, with about half of that total from DERs. By 2020, solar generation projects to supply more than five percent of electric generation in the United States. Since their inception in 1983, net energy metering (NEM) laws have consistently proven to be the most effective method of encouraging the proliferation of DERs, but in many areas, their time may have passed. NEM and the concurrent influx of DERs have caused a tremendous upheaval in the energy industry. NEM laws are anything if not controversial. Typical NEM laws reimburse customers for their DER generation at retail rates—generous compensation considering the NEM relationship is essentially that of a micro-scale PPA. Most NEM customers don’t pay anything for their electricity since they produce more than they consume. The vast majority of NEM customers generate power through solar panels that only generate electricity during daylight hours. These customers, however, receive power after the sun has set. No matter the time of day, NEM customers use the transmission and distribution system—the wires, poles, and substations to transmit and distribute their energy throughout the grid. NEM customers typically do not pay for the use of this infrastructure, thus leaving this T&D cost to be spread among non-NEM customers. In addition, Federal and state investment tax credit (ITC) and production tax credit (PTC) subsidies for solar installations contribute to DER proliferation. To counter this, some jurisdictions are calculating the locational value of DERs to the overall power system and using this value as more equitable compensation for NEM generation. On the other hand, cost curves for solar have been dramatically declining, which might eventually mean that solar no longer needs subsidies, and can survive on its own. Regardless of compensation, tax credits, or cost, the growth of DERs continues unabated. And that only stands to continue to make integrated resource planning more difficult. Customers choose where to site their distributed generation. As such, there are significant differences in DER installations among geographic locations. The effectiveness of renewables, especially solar DERs, cannot be extrapolated from one geographic area to another. There needs to be a recognition about the regional differences of numerous factors: appliance saturation, number of heating and cooling degree days, construction standards, avoided costs, economic impact, capacity factors, load shapes, and circuit saturation. DER maps can tell resource planners a lot of information about how DERs operate throughout the day, thus helping to develop an IRP that considers this information in light of all other generation necessary to meet demand. For this, a DER map would have to identify where on the power grid DERs are located, what their operating curve looked like, how it changed dynamically as the DER assets operate (turn on and off), and how their output changed in response to cloud cover and the sun’s reemergence. When all this data is available, resource planners can start to build more probabilistic or scenario-based curves around the geographic location of future investments and how better to manage the daily operation of the grid. DER maps do exist. Some states (such as New York and California) are mandating that utilities create, manage, and publish them. 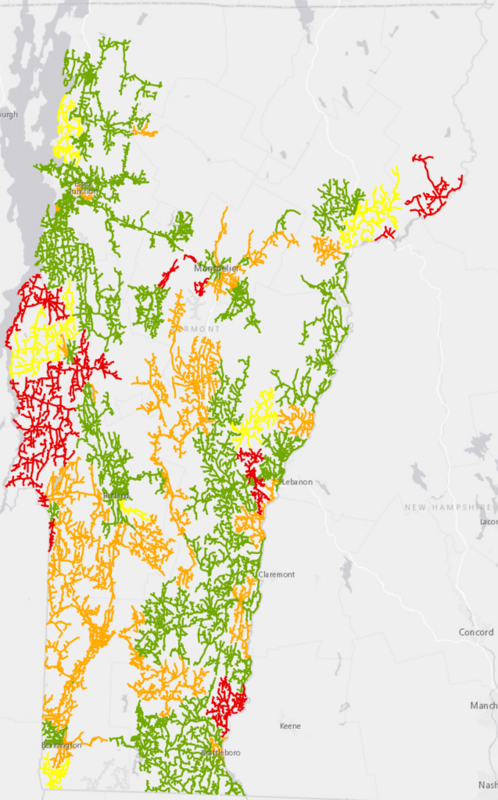 In Vermont, the state’s largest utility, Green Mountain Power, already maintains and publishes a comprehensive DER map (Figure 3) on their company website. This map details where DERs are prevalent, where they are not, where DERs might be valuable additions to solve system problems, and where they would definitely not be of value (such as when a feeder is fully loaded and constrained). This map allows customers and small DER developers to see how their installation would fit into the overall picture of DERs across the utility’s service area. The Green Mountain Power DER map also displays a great deal of useful and color-coded information (Figure 4). Icons represent substations, solar installations (green and yellow suns), wind installations (wind circles with green dot centers), and other types of generation (icon with a yellow X). Clicking on an icon reveals detailed information about that installation and the its circuit. Installation information includes its type (solar or wind) and its output capacity; circuit information includes the circuit rating, feeder ID, substation, rating, distributed generation (DG) on the feed, transformer capacity, DG on the transformer, and the remaining capacity in kW and percent of total circuit capacity. Net energy metering laws and investment tax credits opened the door for an advantageous return on investment for homeowners to install solar PV systems and for developers to design and build small-scale wind and solar facilities. The visibility of these rooftop and small-scale solar and wind facilities captured the public’s interest. Meanwhile, the real and present challenges that utility operators face managing the myriad of technical issues that come from these distributed systems are hidden from public view. Few originally understood these challenges, even in the electric utility industry. The two-way flow on circuits that were designed for one-way flow presented significant challenges. Without additional devices, monitoring and managing the amount of power from these decentralized and distributed systems was mostly guesswork. In addition, protection control schemes were simply not set up to allow the system to operate safely and avoid the destruction of assets and increases in outages. Initially, distribution engineers scurried, trying to solve one distribution problem after another. Utilities, unprepared for the DER onslaught, were frequently caught unawares and, as a result, were slow to react. Utilities have since realized that the technical changes, organizational changes, planning changes, cultural changes, financial changes, and business model changes that result from the DER revolution are stunningly large, although, with strong leadership, surmountable. Utilities have realized that transmission and distribution planning must be integral to integrated resource planning. A number of new factors affect the planning of increasing amounts of DERs. Insufficient Planning Models.Most modeling tools that exist today are not wholly sufficient when planning for increasing DER penetration, as they do not fully encompass the requirements necessary to develop sound resource plan generation portfolios. Unit commitment, commit-to-dispatch, production cost, system expansion, system optimization, long-term portfolio expansion, short-term operational, as well as many other models typically use hourly projections. They operate on a basis of 8,760 hours in a year. As such, they don’t necessarily do a great job planning for ancillary services, since both large-scale wind and solar, and DER resources have significant intra-hour variability. DER modeling efforts require sub-hourly analysis. It’s also difficult for these hourly models to take projected load characteristics, load shapes, and generation shapes of variable generation and determine how that affects the rest of the system. Technology shifts, policy shifts, and aggressive Renewable Portfolio Standards (RPS) as well as Vermont’s Renewable Energy Standard (RES) targets all affect the integrated resource planning process and are leading to a carbon constrained future. The impact of different carbon scenarios enhances a shift toward more renewable generation, which only serves to exacerbate the modeling shortcomings. Estimated Distributed Generation Tracking. Today, no utility dynamically tracks DER generation. Utilities do not track excess solar energy from one customer that is then used by another customer on the same circuit or is used by a customer on a neighboring circuit. Utilities instead rely on historical and background data of DER activity on the entire system, and then analyze that information for forecasting. But DER activity is volatile during the day, and from day to day, so at best, the forecasting is an estimate. Accurate DER information is necessary to assess both required and unnecessary transmission and distribution upgrades, and increased DER visibility is necessary to more efficiently operate the grid. Operational Technology Systems.Two system management software packages are enabling utilities to better manage the daily integration of DERs: Advanced Distribution Management System (ADMS) and Distributed Energy Resource Management System (DERMS). An ADMS supports distribution management and optimization and includes functions that automate outage restoration and optimize the performance of the distribution grid. ADMS functions include fault location, isolation and restoration; volt/volt-ampere reactive optimization; conservation through voltage reduction; peak demand management; and support for microgrids and electric vehicles. An ADMS allows for more effective and tighter control of grid operations, enabled by sensors, grid-edge automation, bulk data processing, and other technical refinements. A DERMS manages DERs and other demand-side energy resources. It better enables the integration of DERs, distributed energy storage, demand response, and other energy resources. A DERMS focuses on aggregating small-scale DERs into a size large enough and with less complexity to enable an ADMS to use the DERMS-aggregated assets to control the grid. Working in concert, these software and control packages allow a utility to model power flow, on-the-fly, daily and even hourly. This enables, for example, the control switching feature in the software to shift load from one feeder to a parallel feeder in response to dynamic DER activity. This makes better use of daily DER generation, enables better DER integration and installation site selection, and lowers demand for central station power. Essentially, these software packages enable smart, dynamic, and agile operation of the grid. Both operational technology packages, however, are complex enterprise solutions to a growing problem. In general, utilities are faced with either altering the off-the-shelf software to match their legacy business processes, which requires expensive software customization; or change their business processes to conform to the software requirements, which requires intensive personnel training. Specialized DERMS packages, however, can often be implemented directly “out of the box”. For example, DERMS packages exist that enable a utility to aggregate the energy and power available from small, distributed customer-owned and sited batteries, then manually or automatically control and shift the discharge from these batteries to help meet peak demand. Other packages enable a utility to manage distributed customer appliances that participated in demand response programs, which can help shave spikes in demand. While commercially available and being successfully employed by numerous utilities, ADMS and DERMS are still latent technologies. Since 2016, a number of utilities have been working with the Smart Electric Power Alliance (SEPA) to develop industry-wide requirements for DERMS. These requirements are not expected to be implemented until mid-2019. Accurate electricity demand forecasting is becoming increasingly challenging. Despite population growth, electric demand has been declining since 2007. Various load-eroding drivers, industry-oriented and otherwise, are the main drivers. Chief among them are energy efficiency, demand response, smart appliances, smart grid, smart cities, and customer choice. Other reasons for this decline include efficient heating and air conditioning systems, more efficient residential and commercial buildings, the switch to more efficient lighting, and of course, the rise of distributed generation and small-scale renewable plants. All challenge traditional load forecasting. DER integration is largely outside the hands of utilities. Many factors affect the proliferation of DERs, from rooftop solar to community-based renewable energy to small-scale solar and wind plants. Without this control, forecasting DERs becomes a flawed process, which directly affects the planning of the entire portfolio mix. Critical Input Assumptions and Drivers.Integrated resource planning must balance the interdependencies of forecasting, locational value, interconnection, and hosting capacity, as well as the interactions among other aspects of the utility function: transmission planning, distribution planning, operations, customer programs, asset management, and regulatory affairs. As previously noted, the modeling and analysis of incorporating DERs into the resource planning process is behind the curve and needs to drastically improve. Current models are not capturing the real-time operational challenges of a generation fleet, nor their associated economic impacts. Modeling input assumptions must be thought through carefully because, more and more, they interact with each other. Most assumptions become stale by the time an IRP is filed. Projecting them is becoming less reliable, has shorter horizons, and is rapidly changing. Assumptions are much more sensitive and volatile; small changes can result in substantial changes to the resultant portfolio. A high number of variables with a wider range of possibilities affect the integrated resource planning process: added uncertainty about future conditions and technologies; speculation regarding federal, state, regional, and local statutes, rules, and tax incentives; shifting community mores; unpredictability of the commodity markets; the cost and increased efficacy of new variable renewable generation over time; and wide-ranging assumptions and costs. A closer look at assumptions regarding renewables and their related costs can be enlightening. How do utilities arrive at key assumptions that impact selected generation in an IRP when DERs are beyond their control? What is assumed for the capacity factor of variable renewables over time? What is assumed for the integration costs of renewables? How are those costs calculated? What is assumed for solar PV’s contributions to peak when those contributions fluctuate throughout the year? Not only do these assumptions vary widely within a year and from year to year, but also directly affect how valuable a resource is and whether a planning model selects it. Because of the volatility of input assumptions, action plans have become less resource specific and more about projected need, being agnostic to resource. The Shortening Reliability Horizons of Long-Term Forecasting.IRPs are generally filed on a three-year cycle with annual updates to fine-tune results. Many utilities are finding that these annual updates are becoming much more extensive and, in many cases, are fundamentally changing the generation mix and preferred portfolio in areas with substantial increases in DERs and small-scale solar and wind facilities. Essentially, these annual updates have become similar to full IRP cycles because the initial assumptions have dramatically changed and are thus out of date and inaccurate within the year. A number of utilities run their planning models at various times during the year because of these rapidly changing factors. It’s fair to say that the faster the energy industry changes, the more utilities need to run updated planning models, as well as consider the appropriate sensitivities and scenarios to run. Coincidently, long-range planning horizons for developing actionable IRPs has shrunk from 20 to 30 years down to three to five years. As a result, the IRP processes are overly focused on near-term actions, at the expense of long-term considerations. Rapidly changing inputs and assumptions aren’t suitable for long-term planning options and are therefore not fully considered nor included in the resulting preferred portfolio mix. Changing Planning Methods.Modeling traditionally has been based on central station generation with similar capacity factors. Variable distributed renewable generation has much lower levels of reliability with wider ranging capacity factors. There is a fundamental choice of whether to model distributed generation as a negative load or as a resource: generation in front of the meter would be modeled as a resource while generation behind the meter would be modeled as a load reduction. Moving from dispatchable central generation to non-dispatchable variable distributed generator changes the modeling equation, and also changes the modeling parameters for dispatching generation: ramp rate, frequency, response, and number of starts, among others. Traditional resource planning can be quite prescriptive: the same method followed from year to year with rules established by regulatory agencies or legislative mandate. For utilities with low RPS goals (or in Vermont, RES goals) or without increasing amounts of variable renewable generation and DERs on the power grid, resource planning can continue to be prescriptive. Planning an IRP on a system with increasing amounts of DER must also follow the ‘rules’, however the methodology becomes increasingly complex as more and more DERs are added to the grid. A traditional resource planning process does not hold up well when modeling the variable nature of most renewables, influxes in DERs, and the uncertain future of resource planning. Shrinking planning horizons are causing a transition away from prescriptive modeling and giving way to stochastic modeling. Stochastic analysis with statistical models is better suited for short-term planning, such as next month or even next week. To be most effective, the statistics must be accurate around such factors as load, fuel prices, and unit outages. Over the long term, statistics are not going to be as accurate, so stochastic analysis doesn’t always make sense. Nonetheless, the factors necessary for resource planning are becoming increasingly volatile, so short-term stochastic analysis begins to have value for the near term as a way of tightening the long-term IRP vision. Ever Expanding Reserve Margins.DER proliferation results in increasing reserve margins. Consider the growing reserve margin of the Hawaiian Electric Companies as it plans for 100 percent renewable generation by 2045. The utility used to plan with a 20 percent reserve margin. In 2014, their reserve margin increased to 30 percent, then to 40 percent in 2016 (the year they filed their current resource plan). Their projections plan for a 45 percent reserve margin in 2019, and 50 percent in 2021. The North American Electric Reliability Corporation (NERC) creates deterministic reserve margins to guide utility resource planning nationwide. NERC leverages operations from around the country, then create a consistent approach for measuring reliability for the North American bulk power system. NERC considers their current long-term, seasonal assessments of deterministic reserve margins effective for baseload generation (including large hydro), but less effective for variable renewable generation. NERC realizes that their reserve margin guidelines need to be updated and expanded, and so is introducing new measures to consider reliability for systems with increasing amounts of variable renewable generation. NERC, however, understands that it is becoming increasingly difficult to assess reliability factors. NERC is also taking a closer look at the reserve margin targets of ISOs and RTOs. For example, MISO’s reserve margins only project for three years. In the planning period of 2016–2017, the MISO reserve margin was 15.2 percent. It grew to 15.8 percent in the 2017–2018 planning period. Based on its annual loss-of-load-expectation (LOLE) analysis, MISO expects the 2018–2019 planning period to require a 17.1 percent reserve margin. Faster changing reserve margins are yet another reason for shorter planning horizons. Utilities used to be the main entity in planning generation and infrastructure investments. Now, planning is also being done by customers through DER installations and energy usage choices, and by regulators and legislators through mandates and statutes. Beyond DER penetration, two other legislative and regulatory mandates drive the integrated resource planning transformation: RPS (or RES in Vermont) policies and emission-reduction targets, especially from greenhouse gases (GHGs). Meeting Renewable Generation Targets.Resource planning is becoming more a chase for meeting legislative and regulatory mandates than a pure process of developing a generation resource mix that meets demand reliably at the lowest or most reasonable cost. Essentially, it’s integrated resource planning with numerous binding constraints. There is a clear increase in state legislatures enacting energy-related bills, which both influence business decisions and become compliance mandates for electric utilities and other electric service providers. As a result, the bills go deeper into a utility’s planning process and impinge on the utility business model. Policy makers want to affect change, and the IRP has become a vehicle for attaining that change. Policy, however, must be in accord with market conditions. Pushing renewables onto the grid has many benefits, but must be balanced with the availability of renewable generation, current thermal generation, the age of the current fleet, and forecasted demand. In addition, all electric utilities, regardless of their size, must comply with these statewide mandates. Smaller utilities sometimes find these mandates onerous; some are calling for adjustments that consider the various sizes of the utilities. Emission-Based Planning.The majority of carbon reduction goals have been regional, state, county, or city initiatives. These environmental, emission-based goals are one kind of statutory mandate that is driving the development of IRPs. These goals, however, complement the mandates for increases in renewable generation. For example, Vermont GHG reduction targets are 25 percent by the start of 2012, 50 percent by the start of 2028; and 75 percent by January 1, 2050 if practicable using reasonable efforts. No reasonable effort was made to determine if attaining these targets was feasible. As with other states, these GHG targets are quasi-economic assessments that will be attained through the addition of carbon-free strategies. How much renewable generation, what type, and when to build are up to the utility. On the other hand, a true economic target would be a specific emission reduction target, such as reducing carbon emissions from 80 million metric tons to 10 million metric tons. This type of economic target could be an input into an IRP production model, which would then select the best method for achieving that goal. This method could possibly include energy efficiency measures and demand response programs together with specific amounts and types of renewable generation. Prescribed Planning Processes.More and more, commissions across the country are beginning to take a more prescriptive perspective in the creation of IRPs. Early in 2018, the California Public Utility Commission (CPUC) published an extensive methodology for the majority of load serving entities (LSEs) in the state to create an IRP. That order included specific steps for conforming with GHG reduction and RPS goals. In conjunction with that order, the California Energy Commission (CEC) published a similar plan for 16 municipal electric utilities to follow. These were the first mandated IRPs in California. Those orders not only included a number of other goals to meet the state requirements, but also an extensive list of assumptions to use as inputs for the specified modeling tool (RESOLVE). This methodology was highly prescriptive. Other state commissions have issued orders for prescriptive methodologies for developing IRPs; some states issue these orders as guidance that doesn’t necessarily have to be followed. For example, Vermont’s Department of Public Service, in its 2016 Comprehensive Energy Plan, included a 30-page appendix containing their guidance for the state’s utilities when creating integrated resource plans. Regardless of whether these orders must expressly be followed, or are suggested guidance to follow, all are detailed. 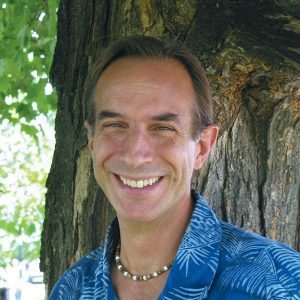 As an example, in its order rejecting the 2013 IRP of the Hawaiian Electric Companies, the Hawai‘i Public Utilities Commission published their 30-page Commission’s Inclinations on the Future of Hawai‘i’s Electric Utilities, which the commission expected the utility to follow as a foundation for its next resource plan. Michigan, however, took a different tack. Act 341, which became effective on 20 April 2017, required each rate regulated electric utility to file an initial IRP within two years, and to file an updated IRP at least every five years thereafter. While the Act directed the Michigan Public Service Commission to establish modeling scenarios and assumptions each electric utility should include in their IRP, each utility could also model and analyze their own scenarios and assumptions. The approach allows the Commission to compare all filed IRPs around a base case, and also to evaluate each IRP on its own merit. Increased Intervenor Involvement.The number of intervenors is increasing, and so is their influence on policy. Typically, intervenors have included customer advocacy groups, business customer groups, renewable advocacy groups, environmental groups, and citizen utility boards. Now, a broader range of groups is becoming involved, including direct-action groups, vendors, power producers (both thermal and renewable), and smaller vendors. Rather than watching and commenting, this broader range of intervenors wants to be part of the planning process. As the number intervenors and the scope of their interests has expanded, so has the level of their commentary and involvement. These intervenors are starting earlier in the resource planning process, becoming involved in defining and developing measurement metrics to better impact the end results that most benefit them. Commissions are more seriously considering intervenors, and increasingly allowing them into resource planning dockets. Intervenors are not only providing specific input to the planning process that utilities must then include in their modeling and analysis, but also their perspective on the resultant resource plan. Many utility executives and resource planners realize that not only are public utility commissions scripting guidelines, but so too are intervenors and stakeholder groups. issues. Many intervenors either don’t understand the entire process or are disinterested in it. But intervenors are very well represented, and thus have the ear of commissions. Intervenors employ skilled people who are expert in their particular areas, and these areas span a wide array of issues that are addressed in resource planning. At its best, these intervenors make the utility think about this array of issues and carefully consider them. When this happens, the entire process and its results stand to gain. The Increasing Need for Collaboration.Collaboration appears to be the key to avoiding myopic mandates while jointly pursuing goals beneficial to the environment and society at large. Cognizant of the enhanced status afforded intervenors, utilities have been proactively engaging with related organizations in the development of their resource plans through stakeholder communication efforts. These organizations (such as the Smart Electric Power Alliance) help utilities communicate with each other around the transition to clean power. But utilities have also reached out to environmental organizations as a way of working together toward a common goal. Changes in leadership in some environmental organizations has helped this process along. To balance this influence, utilities have found that working in concert with regulatory bodies enables a smoother transition process and more sound policies. For this to be most effective, however, utilities have to embrace the shifting foundation of the electric industry and undertake a forward-thinking strategy. The fulfillment of the grand promise of energy storage technology will be the ultimate game changer for variable renewable generation as well as for transportation electrification. The biggest promise is a cost-effective, controlled, dispatchable time shifting, at scale, battery energy storage system (BESS) that would dramatically change the entire operation of the system. Operators can avoid peaks, economically dispatch at granular levels, shape the discharge of energy at the grid edge, satisfy energy requirements, and satisfy distribution services requirements (such as ancillary services at the distribution level). For this to happen, the cost of storage must drop to the point where these services become economically viable. At many levels, this promise is already underway. On 8 November 2018, the California Public Utilities Commission approved four energy storage projects for Pacific Gas & Electric to replace three retiring gas plants. These projects total 567.5 MW and 2,270 MWh of storage, including a 300 MW–1,200 MWh project from Vistra Energy and a 182.5 MW–730 MWh project from Tesla that PG&E would own. Those batteries, once completed, would be the two largest in service in the world. These battery energy storage projects are replacing a 580 MW gas plant and two 48 MW gas plants. Integrating Storage into Resource Planning.With the tools available today, effectively modeling energy storage in the resource planning process is difficult. Headway, however, is being made. Regulators are being encouraged to create policies and procedures that require energy storage to be part of resource planning and part of their power systems. And they are responding. Some utilities have responded by developing proprietary energy storage modeling tools, but so far, these attempts have not provided full-scale modeling nor can they be effectively run by other utilities. The IREC report referenced a primer from the Energy Storage Association that recommended a number of operational benefits of energy storage be included in sub‑hourly modeling: capacity value of storage, regulation, load following, contingency reserves, and a number of avoided cost benefits (such as reduced start-up and shut-down costs, improved heat rates of thermal plants, and reduced curtailment of renewable resources). Integrating energy storage into resource planning requires changing the planning paradigm to include storage as a resource, changing resource-modeling guidelines to better assess the costs and benefits of storage, and affirming that rules for other resources apply to energy storage. Energy Storage as Peakers.Large-scale solar plants, if held in reserve from their daytime highs in storage facilities, can provide the ramping necessary to respond to the evening peak. Resource planners who understand these capabilities can model this into their system. Specifically, solar generation withheld during the latter part of the daytime generation window with time-shifting battery storage, can then be used as ramping for the evening peak through automated generation control (AGC) software. AGC on solar is digital and the response is virtually instantaneous, so the ability to manage the system can be precise. If necessary, AGC’s response time can be programmed to be slower, or more gradual. The AGC can also be used to manage the entire system to be more efficient, which can minimize the need for, and maximize the use of, energy storage. An updated two-way transmission system is necessary to integrate these plant controls, as well as a solar plant of at least 30 MW to 50 MW. DERMS software packages are being developed that can aggregate the stored energy from numerous small-scale solar installations to shave evening peak. Transportation Electrification Projections.Electric vehicle sales—plug-in hybrid electric vehicles and battery electric vehicles—have increased steadily in year-over-year gains for each of the past 42 months. As of September 2018, more than one million plug-in EVs have been sold in the United States. A common assumption among regulators, legislators, and other electric utility industry stakeholders is that increases in EV sales will reverse the downward trend in demand, but a closer look reveals that this does not appear to be the case. Electricity consumption is expected to grow as plug-in EV sales increase. The EIA’s most recent Annual Energy Outlook forecasts electricity demand from light-duty vehicles growing to more than 48,000 GWh by 2030. What’s unclear is whether this growth will constitute meaningful load growth. Efficient electrification will most likely temper load growth. Recent studies show that widespread transportation electrification (including medium and heavy-duty vehicles), while spurring electricity growth, will result in only about a one percent annual load growth. EV adoption rates, however, are uneven across the country, being concentrated along the east and west coasts, so will affect individual utilities differently. The timing of unmanaged EV charging, if concentrated in the evening and overnight hours, might contribute to peak load. While utilities are increasingly using EV projections as an input into their resource planning, their accuracy has been mixed. Projections have thus far been small, from 1% to 5% of expected demand. Some projections show that even EV growth of 25 percent over the next decade increases load by only about 0.5 percent. With ongoing customer involvement in power generation, utilities can no longer afford to operate in a vacuum. The need for increased transparency and simple, clear public communication is self-evident. The vast majority of people outside of the energy industry simply do not comprehend the extreme difficulty of integrating variable renewable generation, especially DERs, onto the power grid, to say little about the profound and fundamental transition to a two-way electric power grid. Communication is becoming more difficult mainly because the audience is less knowledgeable about the electric power industry. While the audience is expanding to include people who are not industry savvy, even industry insiders are finding it difficult to keep up with the ongoing rapid changes. Effective stakeholder communication can drive and clarify planning objectives. Regulatory staff, consumer advocates, DER developers, environmental advocates, technology providers, resource organizations, ISOs, retail suppliers, trade groups, and many others, but especially small customers and homeowners, can all stand to benefit from communication that is directly aimed at their level of knowledge. Utilities have heard enough from industry insiders and the “usual suspects” of intervenors, and instead want to hear more from homeowners. To create this dialog, utilities must employ a number of creative and engaging communication avenues—especially from social media avenues and text messaging—that proffer two-way conversations to encourage interaction on a human level. Electric utilities have been developing IRPs for decades. Electricity demand is projected over the planning horizon, then generation and demand-side management options are assessed, chosen, and planned. Transmission and distribution planning were adjunct to that process. In the current electric utility climate, transmission and distribution planning is integral to integrated resource planning, and includes incorporating higher levels of DERs, replacing aging infrastructure, and enabling greater customer choice and improved efficiency. A third component to the evolving nature of resource planning is grid modernization. Is Integrated Resource Planning Becoming Obsolete? As DER penetration rises to very high penetration levels, the traditional IRP process becomes a task almost certain to fail because planning assumptions become increasingly volatile. Planning assumptions in a large-scale, dynamically changing, high-penetration DER environment can never capture the complex power flow reality at each circuit and feeder. When the scale of individually-modeled, small-scale, variable renewable assets reaches such a large amount that it cannot humanly be anticipated or comprehended, the validity of integrated resource planning begins to wane. Deliberative central planning in its current form, then, increasingly does not make sense once DER penetration reaches very high levels. Integrating larger and larger amounts of DERs and managing their hour-by-hour fluctuations starts to make integrated resource planning somewhat misleading, if only because the related planning assumptions have shorter and shorter life spans. Because of this scattered, small-scale generation, modeling becomes more probabilistic in an attempt to aggregate DER penetration to meaningfully plan for transmission and distribution needs, grid modernization, and a preferred portfolio mix. Coupled with that is the need to reduce the utilization of central generation capacity. What becomes necessary is a much more tactical, reactive approach to managing system operations and determining where best to make investments. At some point, software models become necessary to both plan and operate the system. It appears that machine learning and artificial intelligence will become necessary to effectively develop scenarios that can accurately predict and plan what a system is going to look like. Planners will then need to assess that machine output and develop action plans to implement it. As integrated resource planning in this environment slowly becomes obsolete, it is being replaced first by integrated distribution planning, and ultimately by the wider reaching integrated grid planning which incorporates resource planning, transmission and distribution planning, and grid modernization. As DERs proliferate, distribution system planning becomes more difficult. There’s far less visibility on a distribution system than on the transmission system. There are many more assets and moving parts on the distribution system, especially as customers make their own choices about installing distributed generation and localized energy storage. Distribution system planning is evolving because of shorter planning horizons, increased level of detail (including DERs), and greater regulatory involvement. Common emerging distribution system planning elements include DER forecasting, DER locational value, hosting capacity analysis, circuit reporting, non-wires alternatives, and engaging stakeholders (including third-party service providers). There are several additional tasks that make distribution system planning more difficult. Since distributed resource values are highly locational, optimizing their placement on the grid requires a process for calculating locational values. Hosting capacity analysis allows a utility to identify how much generation can be attached to a particular feeder before upgrades are necessary, which in turn informs third-party investments. Identifying poor-performing feeders can help inform investment needs and high-value, non-wire alternatives. Comparing traditional, wire-based investments with alternatives such as energy efficiency, demand response, distributed generation, and storage is a complicated process, but one that must be considered so as to eliminate system investments that will soon become stranded assets. Enhanced distribution planning is already starting to take hold. New York’s Reform the Energy Vision (REV) initiative requires the state’s IOUs to develop and file distributed system implementation plans (DSIPs). The IOUs are deregulated wire companies, so these plans are agnostic to type of generation, especially customer-owned DERs. The content of the DSIPs is wide ranging, and includes technical components, market mechanisms, geographic penetration considerations, capacity markets, pricing mechanisms, reliability needs, and broad system components such as interconnection issues, distribution upgrades, economic congestion surrounding transmission options, and even subtransmission issues. 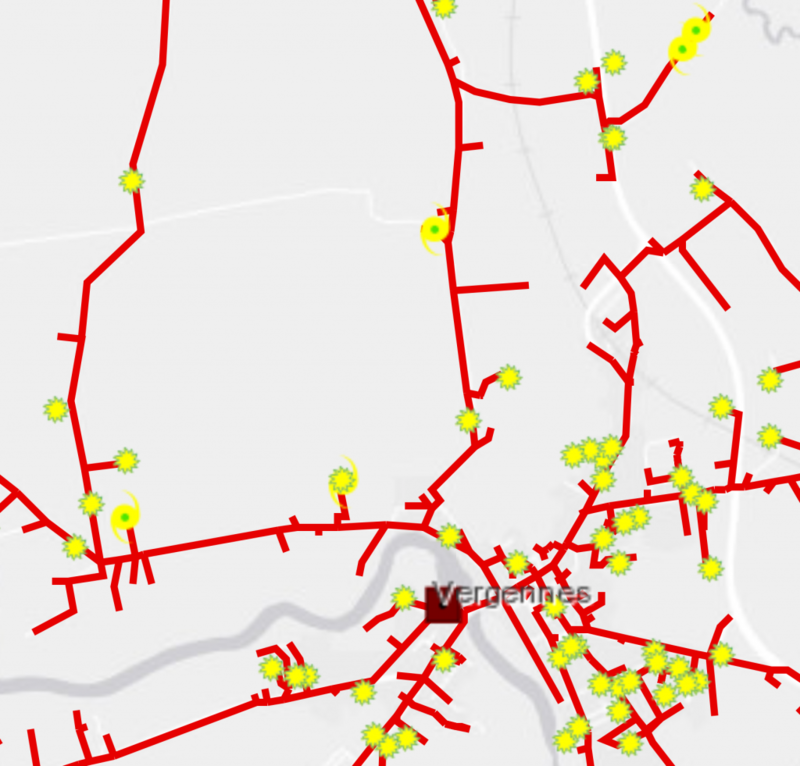 These plans chart a new path for distribution system planning. Data, systems, sensors, and communications networks that enable enhanced visibility and understanding of the distribution system and control of devices and resources connected to it. Technologies and equipment that facilitate greater customer engagement regarding energy usage and alternatives. The underlying systems, data management, and analytics that facilitate situational awareness. Advanced metering and monitoring, distributed generation integration, and DER planning are some of the most common examples of grid modernization. In 2017 and 2018, 39 states and the District of Columbia processed legislative and regulatory action on grid modernization. Areas under regulatory action include energy storage, overall grid modernization, smart grid and advanced metering infrastructure (AMI) deployment, time-of-use rates, distribution system planning, utility business model reforms, microgrid deployment, and non-wires alternatives. According to the DOE’s Grid Modernization Initiative, the national power grid—based on large-scale generation remotely located from consumers, hierarchical control structures with minimal feedback, limited energy storage, and passive loads—does not have the attributes necessary to meet future demands. 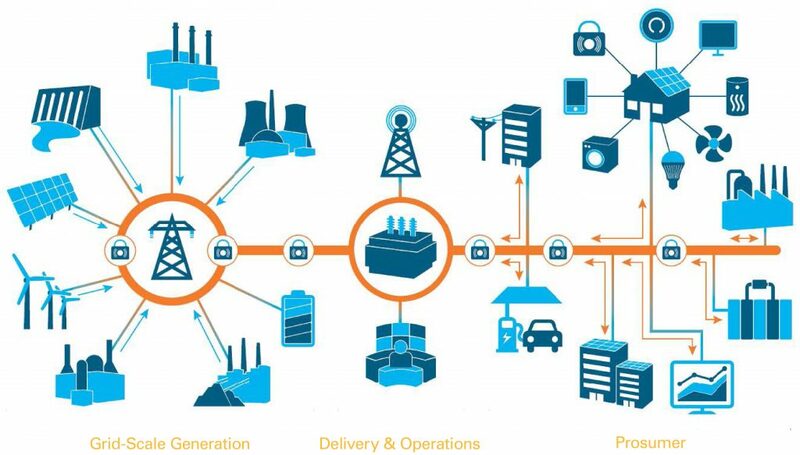 Transitioning to a modernized grid is an ongoing process: transforming from a monolithic grid to one that is modular and agile; from centralized generation driven by affordability and reliability decisions, to one of both centralized and distributed generation, and intelligent load control characterized by cost and environmental sustainability, contained events, personalized energy options, and security from all threats. 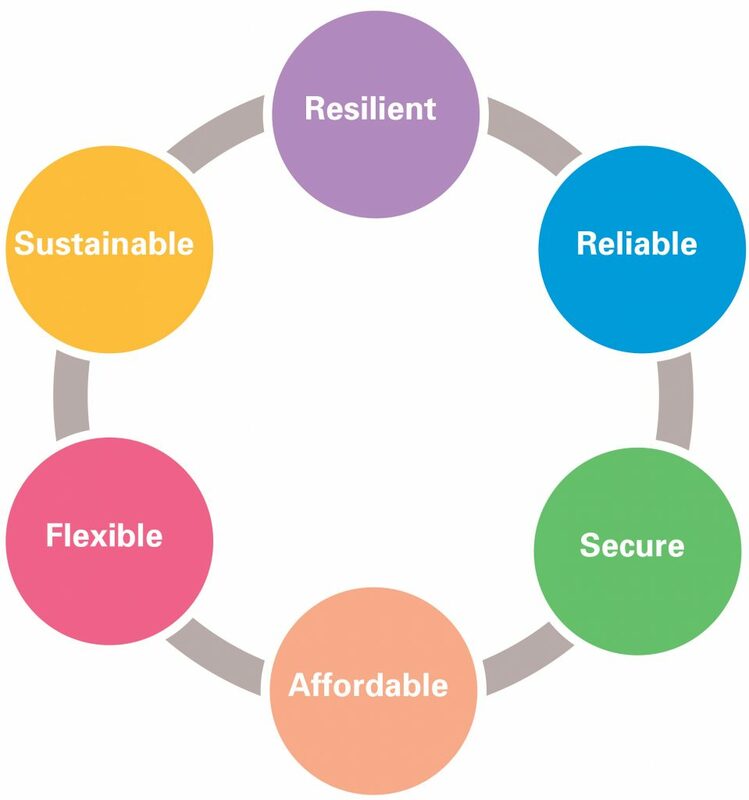 A modernized grid must stimulate innovation while balancing six attributes, which compete with one another for resource dollars (Figure 5). Resilient. Recover quickly from any situation or power outage, and from hazards of all types. Reliable. Improve power quality and fewer power outages for everyday operations. Secure. Increase protection to critical infrastructure from an increasing and evolving number of threats. Affordable. Maintain reasonable costs to consumers and for economic prosperity. Flexible. Respond to the variability and uncertainty of conditions at one or more time scales, including a range of energy futures. Sustainable. Facilitate broader deployment of clean generation and energy-efficient end-use technologies. Five key trends drive the ability of the grid to provide needed services, while transforming the grid into a platform for greater prosperity, growth, and innovation. Changing mix of types and characteristics of electric generation (in particular, variable, distributed renewable energy). Growing demands for a more resilient and reliable grid (especially from weather as well as cyber and physical attacks). Growing supply-side and demand-side opportunities for customers to participate in electricity markets. Emerging interconnected electricity information and control systems. Grid Modernization Integral to Resource Planning.Grid modernization is fast becoming integral to resource planning as a way to better maintain reliability and respond to fluctuations in variable generation. This is also a recognition of how more distributed resources brings with it challenges that require coordination across both transmission and distribution as well as resource planning. Planning for grid modernization requires that a utility identify not only what to build, but where and when. This detailed planning is far more complex than traditional distribution planning, which ensures all substations and wires had the capacity to serve customers attached to them. Insufficient capacity requires a straightforward solution of serving more capacity through additional wires and transformers. Concurrently, traditional integrated resource planning requires planners to consider the resource options needed across of variety of uncertain futures, assessing factors such as weather, customer needs, technology, and policy—but at a system-wide level where each identified future has only one set of needs to meet and a consistent set of resource values. Integrated grid planning combines the complexities of all three: resource planning, distribution planning, and grid modernization. Distribution planning must still consider every line and every substation to determine if existing equipment can meet customer needs, but now must plan across a variety of potential futures that vary based on changing customer usage and uncertain DER adoption rates. Instead of evaluating a limited set of wire-based options, utility planners must consider a dynamic portfolio of resource options whose values will change based on the specific needs of each site. This transformation represents considerable challenges. As such, it becomes increasingly important to proactively evaluate distributed resources and optimize their placement and usage for the grid. The ability to identify the value of a given resource in a given location will continue to grow in importance, because as the system becomes more dynamic, resource values do too. Furthermore, as aging grid infrastructure is replaced, utility planners face a new host of replacement options that require more detailed analysis than was historically necessary. This more detailed, integrated planning results in the implementation of new technological options that offer more cost-effective ways of serving customers than traditional infrastructure investments. One main option is a cost-effective suite of non-wires options. Finally, utility planners must adequately anticipate customer and system needs so that capital investments in the grid do not become obsolete before their costs can be recovered. The rapid pace of innovation magnifies the risk of long-term investments and increases the danger of ‘stranded assets’—capital investments that turn out to be unneeded. Integrated grid planning, which considers the entire system, provides important, additional information to ensure that investments are needed and prudent, and are implemented in concert with changes in usage patterns, demand-side and supply-side considerations, regulatory mandates, efficiency measures, DER adoption rates, and customer choice and usage patterns. The evolution of the long-standing utility business model to the utility of the future results from numerous trends, most notably from the continuing addition of customer-owned DERs to the generation portfolio and away from utility-owned central station generation. Other trends include emission reduction goals, RPS targets, energy efficiency and demand response, on-site combined heat and power (CHP), energy storage, and customer choice. In other words, customer actions are having an increased influence on the utility business model. Trends in the electric power industry are not new. Current trends, however, are farther-reaching business model disruptions that are happening at unprecedented speed. As a result, the IRP process is rapidly transforming into one that integrates resource, distribution, and grid planning to better create meaningful and actionable IRPs. In direct response to this IRP transformation, a number of utilities across the country have embraced the utility of the future business model. Some utilities are proactive in this endeavor; others are being gently moved in that direction by their regulatory agencies. In 2020, MidAmerican Energy of Iowa, will become the country’s first investor-owned utility to source 100 percent of its electricity needs from renewable energy when it completes a 591 MW wind facility. In December 2016, the Hawaiian Electric Companies unveiled their path toward 100 percent renewable generation in their most recent resource plan (called a Power Supply Improvement Plan). Green Mountain Power operates on the utility of the future model by basing all its energy-related decisions on the needs of its customers. As evidence, their December 2018 IRP reports that cumulative DERs have increased five-fold since its previous IRP. New York, as a state, has taken the lead in creating the foundation for operating the utility of the future through its REV initiative. REV seeks to attain seven main goals: (1) To reshape the utility business model to favor DERs that support distribution grid operations at the expense of central station power; (2) To increase both distributed and large-scale renewable resources though GHG reductions and RPS goals; (3) To create incentives for geographic siting of these resources; (4) To develop market mechanisms to pay for renewable generation; (5) To create competitive markets for DERs to solve distribution-related needs; (6) To attract investments in customer-owned renewable generation that helps lower consumption (and thus demand) and improves asset utilization to avoid capital intensive investments (as a way to reduce GHG emissions and improve the environment); and (7) To empower customers to help maintain reliability of utility distribution systems through usage patterns. The complications, disruptions, and increasing complexity these trends have on integrated resource planning and the transformation in the planning process simply cannot be overstated. One thing is clear: these disruptions are here to stay. It’s up to individual utilities as to how they embrace these disruptions and adopt the transition to integrated grid planning as a means for creating actionable IRPs. A Good Integrated Resource Plan: Guidelines for Electric Utilities and Regulators; Eric Hirst. Oak Ridge National Laboratory; December 1992. Advancing Past “Baseload” to a Flexible Grid: How Grid Planners and Power Markets Are Better Defining System Needs to Achieve a Cost-Effective and Reliable Supply Mix; Judy W Chang, Mariko Geronimo Aydin, Johannes Pfeifenberger, Kathleen Spees, and John Imon Pedtke. National Resources Defense Council; June 2017. Best Practices in Electric Utility Integrated Resource Planning; Rachel Wilson and Bruce Bieward. The Regulatory Assistance Project; June 2013. Charging Ahead: An Energy Storage Guide for Policymakers; Sky Stanfield, Joseph “Seph” Petta, and Sara Baldwin Auck. Interstate Renewable Energy Council; April 2017. Utilities Commission; Docket No. 2012-0036, Order No. 32052; April 2014. Disruptive Challenges: Financial Implications and Strategic Responses to a Changing Retail Electric Business; Peter Kind. Edison Electric Institute; January 2013. Fifty States of Grid Modernization: 2017 Annual Review; Autumn Proudlove, Brian Lips, David Sarkisian, and Achyut Shrestha. North Carolina Clean Energy Technology Center; January 2018. The Flexible Solar Utility: Preparing for Solar’s Impacts to Utility Planning and Operations; John Sterling, Ted Davidovich, Karlynn Cory, Alexandra Aznar, and Joyce McLaren. Solar Electric Power Association and National Renewable Energy Laboratory; September 2015. Fourth National Climate Assessment, Volume II: Impacts, Risks, and Adaptation in the United States; U.S. Global Change Research Program; December 2018. The Future of Centrally-Organized Wholesale Electricity Markets (Future Electric Utility Regulation Series, Report No. 7); Paul Breakman, Allison Clements, Craig Glazer, Joy Morrison, and Lisa Schwartz; March 2017. The Future of Electricity Resource Planning (Future Electric Utility Regulation Series, Report No. 6); Fredrich Kahrl, Andrew Mills, Luke Lavin, Nancy Ryan, and Arne Olsen. Lawrence Berkeley National Laboratory; September 2016. The Future of Transportation Electrification: Utility, Industry, and Consumer Perspectives (Future Electric Utility Regulation Series, Report No. 10); Jenifer Bosco, John Howat, Philip B Jones, Jonathan Levy, John W Van Alst, and Lisa Schwartz; August 2018. Grid Modernization Multi-Year Program Plan; U.S. Department of Energy, November 2015. The Integrated Grid: A Benefit-Cost Framework. Electric Power Research Institute; February 2015. The Integrated Grid: Realizing the Full Value of Central and Distributed Energy Resources. Electric Power Research Institute; February 2014. Integrated Grid Planning; Juliet Homer. Pacific Northwest National Laboratory; November 2017. Integrated Resource Planning for State Utility Regulators; Cheryl Harrington, David Moskovitz, Tom Austin, Carl Weinberg, and Edward Holt. The Regulatory Assistance Project; June 1994. Load Forecasting in Electric Utility Integrated Resource Planning; Juan Pablo Carvallo, Charles A Goldman, Peter H Larsen, and Alan H Sanstad. Lawrence Berkeley National Laboratory; October 2016. New Business Models for the Distribution Edge: The Transition from Value Chain to Value Constellation. Rocky Mountain Institute Electricity Innovation Laboratory; April 2013. Planning for a Distributed Disruption: Innovative Practices for Incorporating Distributed Solar into Utility Planning; Andrew Mills, Galen Barbose, Joachim Seel, Changgui Dong, Trieu Mai, Ben Sigrin, and Jarett Zuboy. Lawrence Berkeley National Laboratory and National Renewable Energy Laboratory; August 2016. Planning Hawai‘i’s Grid for Future Generations: Integrated Grid Planning Report. Hawaiian Electric Companies, March 2018. Planning the Distributed Energy Future, Volume I: Emerging Electric Utility Distribution Planning Practices for Distributed Energy Resources. Black & Veatch and Smart Electric Power Alliance; May 2017. Planning the Distributed Energy Future, Volume II: A Case Study of Integrated DER Planning by Sacramento Municipal Utility District. Black & Veatch and Smart Electric Power Alliance; May 2017. Regulatory Incentives and Disincentives for Utility Investments in Grid Modernization (Future Electric Utility Regulation Series, Report No. 8); Janice Beecher, Steve Kihm, Ronald Lehr, and Lisa Schwartz; May 2017. Small Is Profitable: The Hidden Economic Benefits of Making Electrical Resources the Right Size; Amory B Lovins. Rocky Mountain Institute; March 2002. State Engagement in Electric Distribution System Planning; Juliet Homer, Alan Cooke, Lisa Schwartz, Greg Leventis, Francisco Flores-Espino, and Michael Coddington. A joint publication of the Pacific Northwest National Laboratory, Lawrence Berkeley National Laboratory, and National Renewable Energy Laboratory; December 2017. State of the Electric Utility Survey: 2017. Utility Dive and PA Consulting. January 2017. State of the Electric Utility Survey: 2018. Utility Dive and PA Consulting. January 2018. Teaching the “Duck” to Fly and Teaching the “Duck” to Fly, Second Edition; Jim Lazar. The Regulatory Assistance Project; January 2014 and February 2016. Treatment of Solar Generation in Electric Utility Resource Planning; John Sterling, Joyce McLaren, Mike Taylor, and Karlynn Cory. Solar Electric Power Association and National Renewable Energy Laboratory; October 2013. Using Renewables to Operate a Low-Carbon Grid; Clyde Loutan and Vahan Gevorgian. California Independent System Operator (CAISO), First Solar, and National Renewable Energy Laboratory (NREL); December 2016. Utility of the Future; Ignacio Pérez-Arriaga, Christopher Knittel, et al. Massachusetts Institute of Technology Energy Initiative; December 2016. Value-Added Electricity Services: New Roles for Utilities and Third-Party Providers (Future Electric Utility Regulation Series, Report No. 9); Jonathan Blansfield, Ryan Katofsky, Benjamin Stafford, Danny Waggoner, Lisa Wood, and Lisa Schwartz; October 2017. Vermont Comprehensive Energy Plan; Vermont Department of Public Service; November 2015. This updated report, originally published in April 2018, is about the wholesale transformation happening in integrated resource planning in the electric power industry, and mainly is the result of primary research. Over the eight months before April 2018, I conducted more than three dozen personal interviews with resource planning managers, resource planners, utility executives, and industry consultants. These professionals spanned the country, from the west coast, through the Midwest, to the east and the south. They are working—and struggling—with various stages of the integrated resource planning transformation. Many of them spoke with the promise of anonymity so that their comments could be forthright and unguarded. Unless otherwise footnoted, the narrative is a direct result of their extraordinary insights and form the foundation of this report. Since the original publishing, I conducted further research into the IRP transformation while helping develop the 2018 IRP for Green Mountain Power, Vermont’s largest investor-owned utility. Both were integral in updating this report. Solari Communication specializes in assisting utilities with the creation of their integrated resource plans (IRPs) through an integrated resource, distribution, and grid planning process for incorporating increasing amounts of renewable generation. We work closely with other professional consultants and, more importantly, with utility staff, management, and executives to create meaningful, actionable IRPs that meet regulatory requirements and generation needs, and that cogently communicate results to all stakeholders.